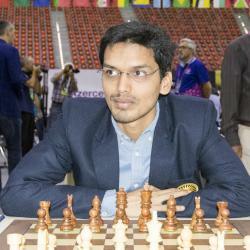 Following the lead of Viswanathan Anand, Pentala Harikrishna is India’s next biggest threat among the chess elite. A prodigy who gained worldwide attention with his numerous youth championship awards and becoming India’s youngest International Master and Grandmaster, Harikrishna has continued his rise into the circle of the world’s best players. After winning numerous tournaments throughout his career, he has recently become India’s second best player along with being one of the top 30 players in the world. Pentala Harikrishna was born in India and quickly became a chess prodigy. At a young age he won multiple youth championship tournaments in India, such as the U8 in 1993, U10 in 1996, U12 in 1996 and 1998, U14 in 1999, U15 in 1998 and the U18 in 1998. At the time, he was the youngest Indian to become both an International Master (in 2000) and Grandmaster (in 2001 at the age of 15). He qualified for the 2001 FIDE World Championship tournament but was quickly knocked out of the tournament. He again qualified for the 2004 FIDE World Championship but was knocked out in the second round by Vassily Ivanchuk. He has also qualified for other FIDE World Cup tournaments and placed in a similar way. Aside from chess, Harikrishna is majoring in political science, sociology and public administration at university. Once he finishes his schooling, he will have more time to devote to chess and will definitely be a player to watch out for.